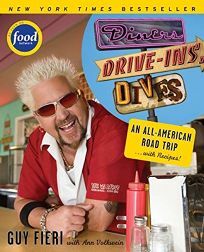 The iron-stomached Fieri, restaurant owner and Food Network personality, has probably choked down more burgers, bacon, pancakes, hash browns and fried eggs than any person should have to, and this dense, photo-packed retrospective allows viewers to replicate many of his favorite restaurants' recipes at home. Like the show, Fieri takes diners on a tour of the country's best local eateries, like Kansas City favorite YJ's Snack Bar, which uses two electric burners and a sidewalk grill to crank out exotic fare from around the world; James Beard Award-winning Al's Breakfast in Minneapolis; and all culinary points in between. The book contains a fair number of predictable classics like coconut cream pie, macaroni and cheese, meatloaf and burgers (including one that's dipped in batter and deep-fried), but has an equal number of interesting riffs such as Cap'n Crunch French Toast, Nut N' Honey Pancakes, Pork and Sweet Potato Empanadas and Chicken Fried Lamb Chops. Viewers' requests are also featured, including the Red Arrow Diner's American Chop Suey. Rounded out with plenty of behind-the-scenes anecdotes and local color, this tour of off-the-beaten-path establishments has enough regional entries to keep culinary road-trippers busy (and full) for many, many miles.